I’m in a bee. Seriously! My first bee (I’m SUCH a bee-newbie that I still have that new bee smell), and wow… what a bee to be in! I’m thrilled and terrified at the same time. Not only are my fellow Traveling Quilts bee’rs AMAZING quilters, but this bee is a round robin and on the last rotation the person quilts and binds their person’s quilt. 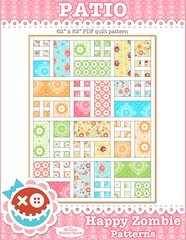 Oh sure, no pressure - I only have to quilt Dan Freaking Rouse’s quilt! It’s like building a car for Lamborghini or decorating Martha Stewart’s house. Nooooooo sweat (beads of sweat dribble off my face and on to my keyboard). But as scared as I am, I’m also thrilled and honored, and honestly - quite giddy to be the person who gets to quilt Dan’s quilt. The premise of the bee is really simple, we all start with a “seedling”, which can be a block, a cluster of blocks, or whateva. It then travels from house to house, and everyone builds upon what the last person added. 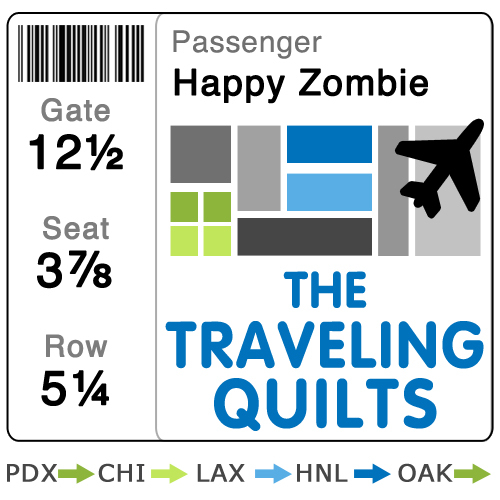 I made “boarding pass” buttons for everyone in the bee - but I accidentally put us all in the same seat. I guess we’ll be needing that seat belt extender. My block is a modified version of my You Are Here block (now it’s become my You Are Home block), and the center house block is a modified schoolhouse block from Quilter’s Newsletter Magazine. I only did one chimney so it looks more like a home than a schoolhouse, and I also reduced the size so it would finish at 4.5″. Lots of trial, error and wishful thinking on the printing. I’m not sure what the final % was, I just got lucky. I’m going to take advantage of my supersize shot, because from here on out I can only show sneak peek pics. And some people think I’m neat, tidy and organized. Bwhahahaha. I made up a little saying for my block and embroidered it to the bottom. Actually, I embroidered it twice. Because four nights of embroidering it wrong is how I roll. 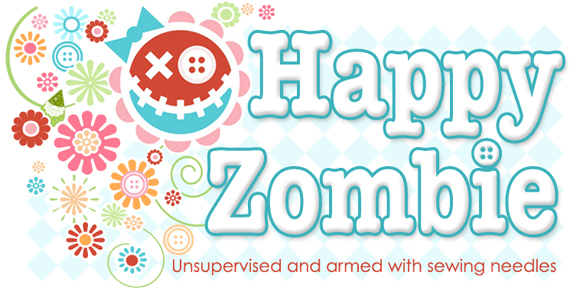 Oh well, I wasn’t feeling the love for the font on the first one, anyway. Now all I need to do is write in my journal and off it’ll go to Dan’s house. And by write I mean that I’ll scribble something in my journal and include a legible (typed and printed) errata to go with it. 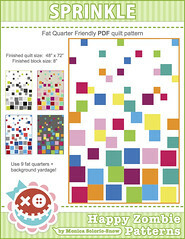 I’ll be sending my quilt-seedling to Dan in California, and then so on and so forth to –> Penny in Colorado to –> Jacquie in Illinois to –> Faith in Illinois to –> Ashley in Vermont to –> John in North Carolina to –> Amber in Hawaii to –> Alissa in California to –> Elizabeth in Oregon to –> Heather in Oregon to –> me in Oregon and then back to Dan with a finished quilt! As much as I want to hand deliver to each month’s package… ohhh, I danno… like a meet-up at Amber’s house (I wonder if Hawaiian Airlines will accept our boarding passes? ), we’re going to have to rely on the planes, trains and trucks of delivery services. This is gonna be so fun! Deeeeeeeeep breath…. wish me luck. Or rather, wish my partners good luck! Monica - I LOVE your block! Thanks for bringing a smile to my face - trust me - I need it today! This block is amazing!! I have never been in a round robin bee before but it sounds like so much fun!!!! Well! I am appalled at what a pigsty that is! 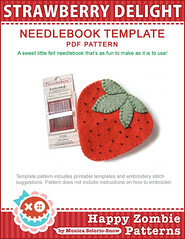 Your block is so adorable and I can hardly wait to see the end product. Zom, I thought you were the Queen Bee? I just took a little trip over to Dans, you are free to continue to sweat. 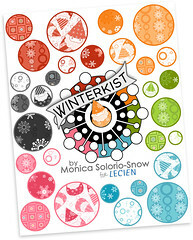 it looks so great, Monica! I love the font redo and your home block is so happy! 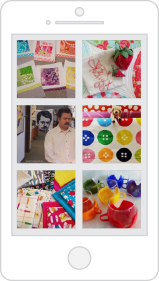 I think I would pee my pants to be in the same bee as those fabulous quilters! This is going to be so fun! My second bee! And a new middle name! Oh Em Gee!!! That block is fabulous! You poor, poor thing — I’m thinking you can’t possibly sleep at night for all the fabulous quilts floating around in your head! I love the new font - cannot wait! 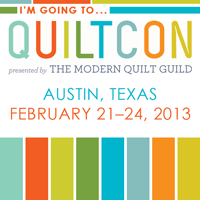 I’m so excited…and I’m sweating bullets too…I have to quilt the founder of the Modern Quilt Guild’s quilt - ack! 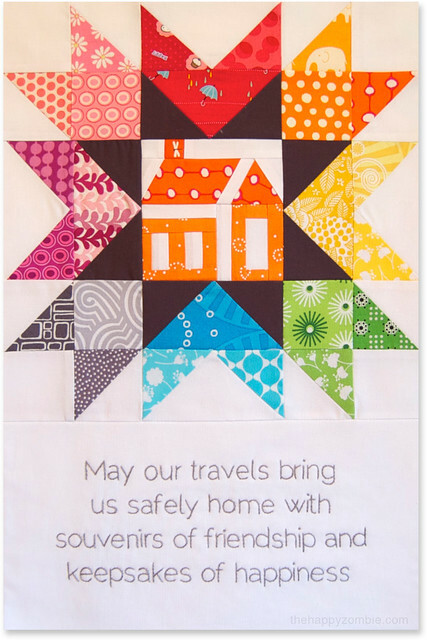 Love love the little house in the patchwork color wheel. Delish! This is going to be a stunning quilt! Can’t wait to see how it gets along! Oooh… how pretty, pretty!!! The rainbow around the house is fantastic - recognized some Happy Mochie Yum Yum in there! Your studio looks like is where you get a lot of inspiration while you’re working. Okay, we’re drooling now. 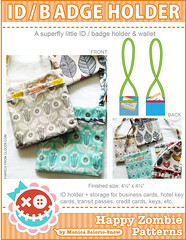 Hope you have lots of fun with your Traveling Quilt Bee! 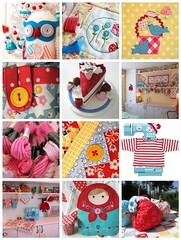 Your block is the cutest thing I have ever seen I love it. Still wishing I was as awesome as you. I really need to jack up my skills. Maybe one day I will be as awesome as you. I doubt it though because you can’t be beat. What a great way to start my morning. A Happy block! In LOVE with your block. Oh my it’s gorgeous!!!! 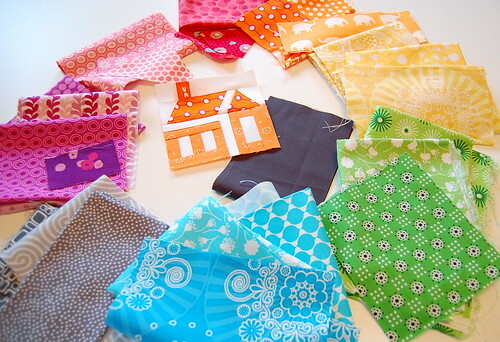 You are all going to have THE most gorgeous and special quilts when you’re done. I can’t wait to see them all!!! And don’t forget to kmamf. xoxo! I’m SO glad you’re along for this ride! Your beginning is FABULOUS. I can’t wait to work on it! when they have a very happy looking space. I can’t wait to see the finished quilt. Crap! Now ANOTHER blog I have to follow! 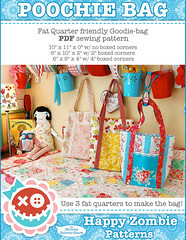 Why must you know all the cool quilters! I am feeling your stress. I can’t imagine the pressure! You’ll do wonderfully of course! 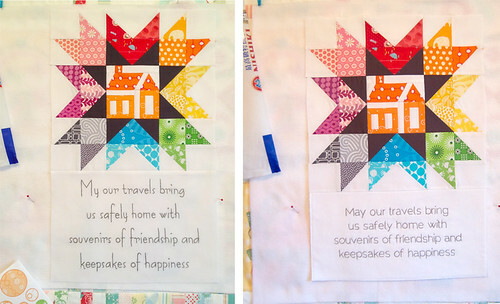 Your block is fabulous, but, but, but, the quilt on the wall behind it, the previous layer of rabid creativity, the yellow polka dot background, that quilt is WONDERFUL. Greedily I ask, is there a pattern for sale somewhere? Great block Monica! 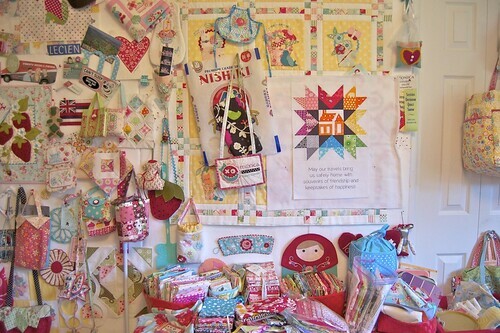 You will love the traveling quilt brigade. 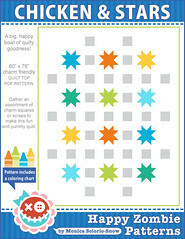 I did several of them 10-15 yrs ago and have several fabulous quilts (and one set of fabulous blocks) to show for them. Now I have a list of what I want to do a mile lone so I haven’t done any in a while but your making me feel the itch again. And I love the REAL photo…made me feel only slightly less adequate….lolac! Round, row, free robins are a blast…in my first now too and the creativeness is amazing! I’m sorry, I don’t know. I did buy it at Cool Cottons in Portland - if that helps any.